Includes unassembled playset, 6 ice cream discs, 5 spoons, 4 dishes, 2 cones, roller, and 6 cans of Play-Doh Brand Modeling Compound. Product Packaging: Standard Packaging Take a magical trip to the Play-Doh Ice Cream Castle! It's a colorfullycreative kingdom where kids can go to make their wackiest ice cream dreamscome true. The whimsical towers of frosty fun create colorful Play-Doh soft-serve treats in unique ways. With the 6 ice cream discs, kids can choosedifferent shapes to press out their swirly Play-Doh ice cream. Just pop oneinto the center tower to switch up the fun! The Play-Doh soft-serve machinealso features an easy-press handle for littler hands. When the dishes arefilled to the brim with swirly Play-Doh treats, move over to the toppingstations to cover them in wacky whipped cream and crazy sprinkles. 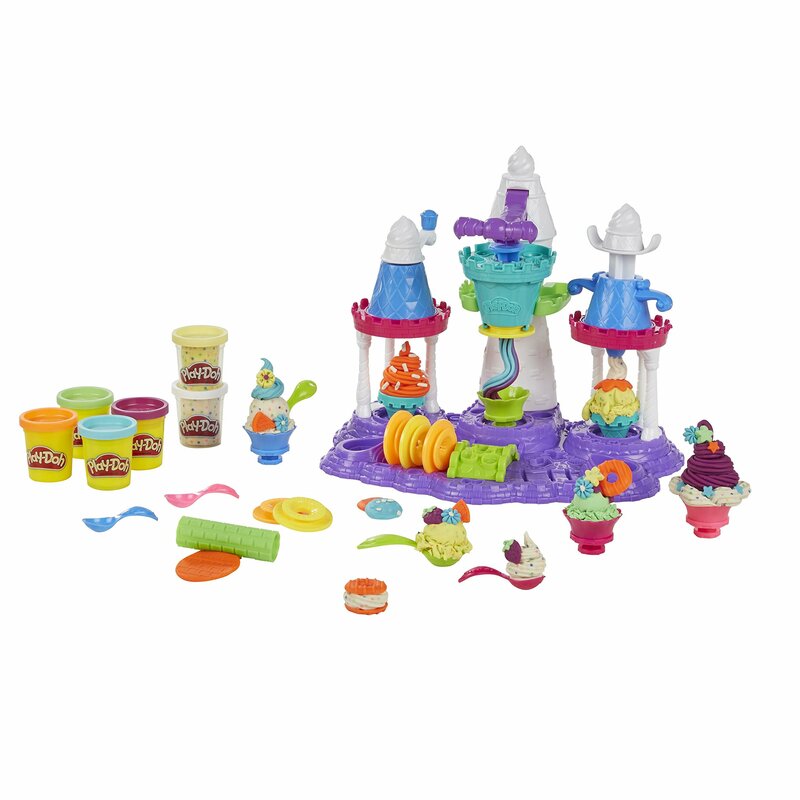 Thesprinkle crank and frosting tool are also removable for freehand decorating.For even more creativity, this Play-Doh ice cream wonderland also featuresConfetti compound filled with specs of colorful confetti! Hasbro, Play-Doh andall related properties are trademarks of Hasbro.